Notes: I’m kicking back on a Saturday night watching the ALCS and getting ready to watch the Oregon State – California game. It’s a great time to try a new beer for the first time, and I’ve got one I’m looking forward to tonight. 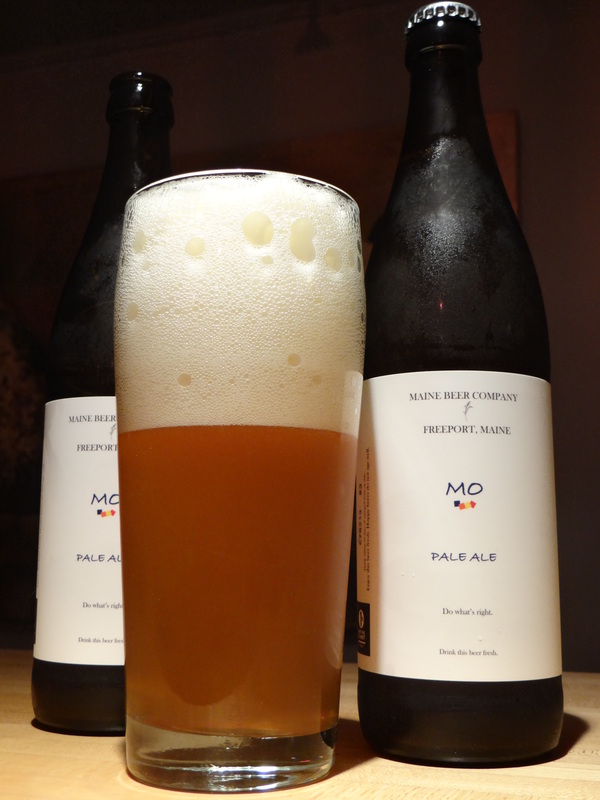 MO, which is made by Maine Beer Company and held in pretty high regard in beer circles, but not sold in Ohio. Recently I came in possession of two bottles of MO by way of Virginia thanks to Chris Hess (with assistance from Andy). MO is technically classified as a Pale Ale rather than an IPA because it is a little lower in ABV (6%) than the average IPA. It’s bottle conditioned (yeast left in the bottle to continue the fermentation after bottling) which is a little unusual for a Pale Ale. This particular beer was bottled on July 9 and so is about 3 months old. As you see in the picture that accompanies this post, MO is hazy golden-orange in color with a massive white head that slowly recedes to a thin, but dense layer of white, meringue like foam that stayed around until I took the last drink. (News flash – I just saw the worst demonstration of baserunning in an MLB game that I can remember. Prince Fielder got caught in a rundown between 3rd and home that ended with a head first slide back into third base that had all the grace of a manatee on the basepaths. When he came to a stop he was still 2 yards from the bag.Now we take you back to your beer review.) Definitely one of the most impressive heads I’ve seen on an IPA, to my memory only West Coast IPA by Green Flash and Single Wide IPA by Boulevard come close. Juicy fresh hop aroma is coming off this beer in a big way. The aroma is strongly slanted toward fresh cut flowery hops. Wonderful smell reminiscent of a wet hopped beer, like Founder’s Harvest Ale, but to wet hop you need fresh cut hops which wouldn’t be available in July. So I’m thinking that hops are added during the fermentation process (dry hopping). The taste is fruity in a generic sort of way with a peppery finish that lingers for a while. The peppery finish is unusual for an IPA and took me by surprise, I went to the web to see what hops were used and found an unusual combination – Warrior, Falconer’s Flight, and Simcoe. Smooth almost creamy finish. Dry with no lingering sweetness like you get in some IPAs. Overall I’d give MO high marks. Fresh floral hop aroma, fruity with a peppery, dry finish and a creamy mouthfeel. It’s like Founders Harvest Ale meets Prima Pils, and the match is sublime. Founder Harvest Ale is coming out next week and I plan to get some and compare to MO. Glad you liked it. Now I feel a burning desire to go grab a bomber and compare my thoughts to yours! That is the desired effect.